Preface: I got to the Braun Music Center at 7:40 pm with my friend Jack. The first two rows of the center aisle were reserved, so I sat on the second row of the left aisle. Soon Campbell Recital Hall was packed and many were turned away. Eavan Boland, Director of the Creative Writing Program, introduced the Mohr Poet, Robert Pinsky, saying that Stanford is a treasure of history. This is especially true of the English Department under Yvor Winters, a magical time when Robert Pinsky, Robert Hass, Philip Levine, and Kenneth Fields all studied here. She then gave the podium to Ken Fields who made a longer introduction of Pinsky, recounting the times they were at Stanford. When Pinsky read his "Shirt Poem", he looked at me while reading the lines "Away from the masonry wall and let her drop. / And then another. As if he were helping them up / To enter a streetcar, and not eternity." I never told him that this was my favorite stanza in the poem, and was ecstatic when he glanced my way. After his reading, many went to chat with Pinsky and have books autographed. I was surprised that my colleague Bill Morrison is here. I gave him a Pinsky flyer last week. Often I'd tell Bill about Stanford lectures on science and cosmology, Buddhism, free film screenings, but he was always too busy to attend. So it was a surprise that he came to the Pinsky reading. I introduced Bill to Pinsky, and Bill said I got him interested in poetry recently. I told Pinsky that Bill is a Computer Science Professor at Foothill College and teaches Java programming, and that he gives me a ride home on Mondays. Pinsky was surprised that I don't have a car. I told him that I don't have a computer or TV home either. Pinsky said "I'm even more impressed." Pinsky's reading from the last Canto of Dante's Paradiso was an added treat. The new poems that Pinsky read from his forthcoming book Gulf Stream were hard to track down on the web. Here are my eight pages of notes of that splendid evening with Pinsky reading his poetry which ended at 9:07 pm. I went back to Green Library to work on the Poetry Anthology which Pinsky assigned as a final project for his Stanford Poetry Workshop. Ken Fields: I can't tell you how much joy that Robert Pinsky is reading tonight. invited to participate in an Arab Poetry Conference. He's in an international figure. at Stanford [1964-66]. Our teacher was Yvor Winters, who wouldn't let us read Whitman. Pecking by ones or twos the rainbowed gutter. 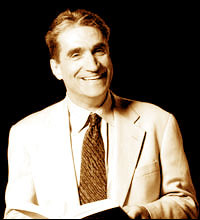 For more than 30 years, Pinsky has influenced the poetry landscape. looking at his own shirt and weaves an entire history in the process. In the '60s, this poem does it better than anything I know. "The Figured Wheel"? The Beatles are a great band. "The Figured Wheel"
and Stan Getz. It's time Robert to come back to the raft. all of you. Now I'll start off with a poem whose theme is I don't need you all. I'm all by myself. It's called "Samurai Song". but elegies. Love poems say I'm burning, I'm freezing. I wish I didn't have this thing. about this. The best I can tell you is a feeling of turmoil and confusion. Address them always as "Profesor." That calls boiled sheep heads "Smileys." Incised his Pashto poems into styrofoam cups. Birth in 1924 and Sylvia falls in 1951. Still nothing finished among the descendants. I'm against: can't stand those Young People. Proud of the fallen, proud of her son the bomber. Ashamed of the government. Skeptical. Said she just couldn't vote to convict a pastor. For Emily Dickinson, for my grandfather. Began in your Feet. It could move up your Back." And pen but books. Hemingway, Dickens. For whatever reason�it is a good in itself. O thirsty shades who regard the offering, O stained earth. There are many fake Sangomos. This one is real. Long pants and underwear, Blacks got only shorts. Otherwise he would not have written those poems. I have a small-town mind. Like the Greeks and Trojans. Shame. Pride. Importance of looking bad or good. In Afghanistan. In Guant�namo he was isolated. Our enemies "disassemble" says the President. Not that anyone at all couldn't mis-speak. Of God or tradition don't also write poetry. Guilts, metaphors, traditions. Hunger strikes. Culture the penalty. Culture the escape. Will your father say, down among the shades? Weight. Only your own Ancestors can help you." My miscomprehension was that "Concentration Camp"
Humiliated: forbidden to let the mind wander away. The adult world used to coerce, like the word "Citizenship"
Emotion was wishing they would call it Conduct, or Deportment. Refugees kept between childhood and adulthood, having neither. In the Holy Land for example, or in Mother Africa. Stammer, poor citizen, you get sullen, you sigh and you look away. I was in the "Dumb class" in the 8th grade. It was also known as the bad class. is green. Next week it'll be ripe. This poem makes use of incoherent response. It expresses my fury of those days as a teenager in school. The apple is still green. I talked to my friends at dinner about jokes. And by jokes, I don't mean witty remarks. I mean the Pope and an optometrist and a zebra go into a bar. And there's the punch line. message on his answering machine telling a joke but leaving out the punch line. and to our mutual friend Elliot Gilbert. Impossible to tell in writing. "Basho"
Impossible to tell a dead-end challenge. They stood before him at attention. "All Flemings,"
Saluting, the man said, "Sir, I am a Belgian." "Why, that's astonishing, Corporal what's your name?" to Dante to look upward, and Dante was already doing it. the oracle that the Sibyl wrote was lost."